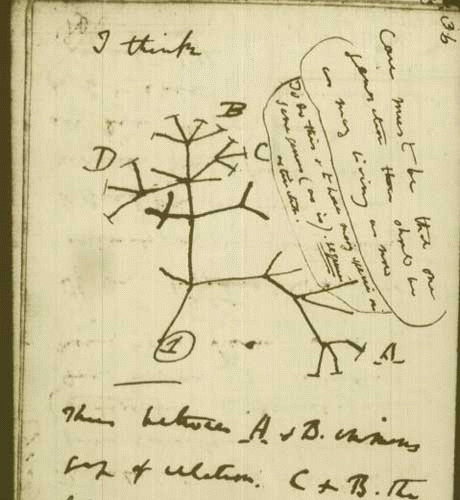 Darwin was first to substantiate the idea of a tree of life. Offspring an be different from their parents, and over generations the differences can accumulate in different directions until the cousins are identified as entirely different species. THAT was the Origin of Species. The idea stood up for 100 years, but we now see a story that is vastly more complicated. At crucial points in the history of life, evolution proceeded via mergers and acquisitions. Bacteria have been passing genes around for 2 billion years or more, shedding copies willy nilly, picking up other people's genes and keeping whatever they find useful. We worry what monstrosities are being created when Monsanto takes a bacterial insecticide gene and implants it in a patented strain of corn. But nature has been performing such chimerical experiments for a long time, though it's probable that the vast majority of these experiments are abandoned before they get very far. The successes are few and far between, but they have had an inordinate impact on the history of life. We know much less about evolution than we thought. David Quammen has a new book. Josh Mitteldorf, a senior editor at OpEdNews, blogs on aging at http://JoshMitteldorf.ScienceBlog.com. Read how to stay young at http://AgingAdvice.org.